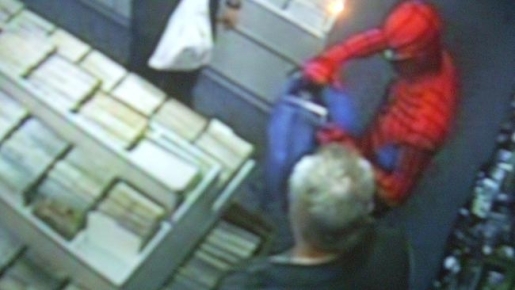 Electron Boy isn’t the only costumed hero busy effortlessly saving the world, as one would-be shoplifter found out. International Free Comic Day, held the first Saturday in May to honor comic books, their fans, and their creators, is also not the best time to get sticky fingers. At Adelaide, Australia’s Adelaide Comics Centre, Michael Baulderstone had encouraged his customers to dress in costumes for the event, and some 40 of them complied. When a man tried to shoplift the massive and expensive X-Men Omnibus, imagine his surprise when Spider-Man confronts him and he finds his way blocked by a group of Jedi Knights and The Flash! The costumed heroes detained the would-be thief until police arrived. Usually the ones in the masks are the bad guys (in real life), but not today. It’s not every day a group of nerds get to turn into awesome crime-fighters, but you don’t need special powers to do good.